And lastly for December and my visit to the Christmas market - the skating rink. I hope you are all enjoying a very happy Christmas. Even if you don't celebrate Christmas I hope you are enjoying time with your friends and family. I love this video of children telling the Christmas story from a different point of view. Thank you so much for reading along with me over the past year. You know me, don't you - those of you who regularly stop by! I sign up for things! I sign up for lots of things! Firstly I have signed up to do One Little Word with Ali Edwards. I have signed up before for the OLW online courses and completed 2011 with RESTORE. In 2012 I got as far as April with FOCUS. I planned for 2013 to be PRESENT however my father was taken into hospital in mid January and died at the beginning of February. OLW went out the window. So I thought it would be great to sign up for this year - I particularly like the new format - and started thinking about a word. I had a long shortlist of words: released, wholehearted, unconfined, trust, forward, confidence, embrace, overcome and was fairly taken with EMBRACE. Then I worked my way through a section on numbing in the Gifts Of Imperfection class and realised that I had 'closed down' since September 2012. When this a-ha moment dawned, my word came to me. PARTICIPATE. I am going to participate in life and although the things that I want to bring into my life are the same things I was trying to RESTORE in 2011, I feel more hopeful of success. Just as I had chosen PARTICIPATE, this popped up on my blog reader. 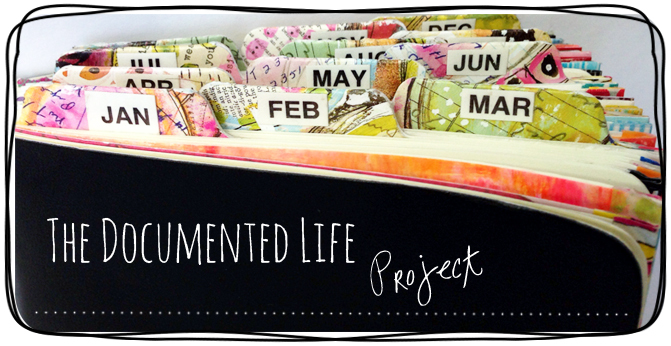 A free project with Roben-Marie Smith and it seemed to me that it was just the thing to record my daily participation in my own life! 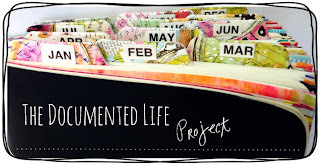 It's a mix of planner and art journal with a weekly challenge from Roben-Marie and her friends. Here's my planner ready for January 1st. I signed up for Creative Jump Start - a great series organised by Nathalie Kalbach. I've watched CJS for the last two years. I don't necessarily do any art as a result but it's a great resource and inspiration. Also in January I will be doing an online class, Studying under the Masters, with Jeanne Oliver and 8 other amazing artists looking at the work of artists such as Matisse, Cezanne and Edward Hopper. And as if that isn't enough I shall be getting back into Textiles with an online course with Ineke Berlyn and a real life class with Hilary Beattie. I did these with Hilary at the NEC last August. There are other things lined up for later in the year but I'm exhausted just thinking about it and I'm sure you're exhausted reading about it all. Come back next year to see how I'm coping! Some years ago Birmingham City Council went through their totally politically correct phase and introduced us to the idea of Winterval - they didn't want to upset the other major religions by putting up Christmas lights! Don't ask! However they eventually saw sense and Christmas has been reinstated! And here are some angles to prove it. Today I thought I would show you some pages I've worked on in my journal this week. I have been doing an online course called The Gifts of Imperfection with the author of the book of the same name. I'm sure you've heard of Brene Brown. Here's one of her conversations with Oprah. You can find videos of her TED talks on YouTube. And at the same time I have been doing, or rather not doing another online class called Made organised by Beth Morey. I haven't been able to do the classes because I wasn't in a place to do them. But after working through the Gifts Of Imperfection pt 1 which included sections on Gratitude and Joy, I was able to start on one of the Made classes: Creative Healing pt 1. This class was created by Megan Armes and from it I have worked on two pages in my journal. On the first page I wrote in pencil, pouring out how I felt and the pain I was holding on to. Physical pain. Spiritual pain. Mental anguish. And then I prayed. After that I scraped Golden Extra Heavy Gel Medium through a teardrop stencil and let it dry competely. Because I don't clean my stencils properly most of the time, the Gel picked up the pink ink that was on the stencil from previous use! When the Gel was dry I put the same stencil in a different place and scraped PaperArtsy Grunge Paste through it. When that was totally dry I painted over the whole page with some PaperArtsy acrylic paint in blue and added some grren highlights to the grunge paste teardrops. When all of that was dry I used a thermofax screen and scraped black acrylic paint through it and when that was dry did it again with white acrylic. I printed out the verse and coloured the paper with Distress Ink, cut it up and stuck it down. For the second page which was a study of Psalm 46 it was suggested that we either told God out loud or wrote down the things in our heart, especially the broken things. I wrote a whole page again in pencil and then covered it up with Gesso. I used two stencils that I had ordered from StencilGirl - Geomaze and Random Circles. I put the Geomaze stencil on the page and covered the top of the page using the diagonal line as a guide and sprayed with blue and yellow Dylusions inks. Then I covered up the bottom part of page and put the Random Circles stencil down and sprayed with the same colours. I sprayed black ink over the whole page using the stencil 'Use Your Words' which allowed the colours to show through the words. They are great words and really vital to life but put on a page like this I felt they represented the clamour of life. I used Dylusions Dy's Alphabet to stamp the words 'be still and know that I am God' and then went over the letters with a silver Signo pen. The silver words show up much better on the page than in the photo! My theme for this month is Christmas and my visit to the Christmas Market in the centre of Birmingham. There was a Big Wheel in Centenary Square. This is a photo taken from the side of the structure of the wheel. Every month on 12 Months in View we take a photograph of the same place, preferably at the same day and time. I take photos of my back garden from my bedroom window. Here's the view last month in November. And here's how it looks now in December.